I can't help myself, I'm hooked on Anna's Polish Restaurant. When my friend Ewa (who is originally from Poland) heard that I'd already eaten here, she wanted to go as soon as possible. So on Sunday afternoon my friend Tommy and I met Ewa and her husband Joe at Anna's. We were in for a treat! They had an unadvertised special on their menu for the day--Pickle Soup. When we arrived, Joe and Ewa were already sampling a taste brought by our waitress. I had a bit as well and was sold on it. It was indeed excellent. 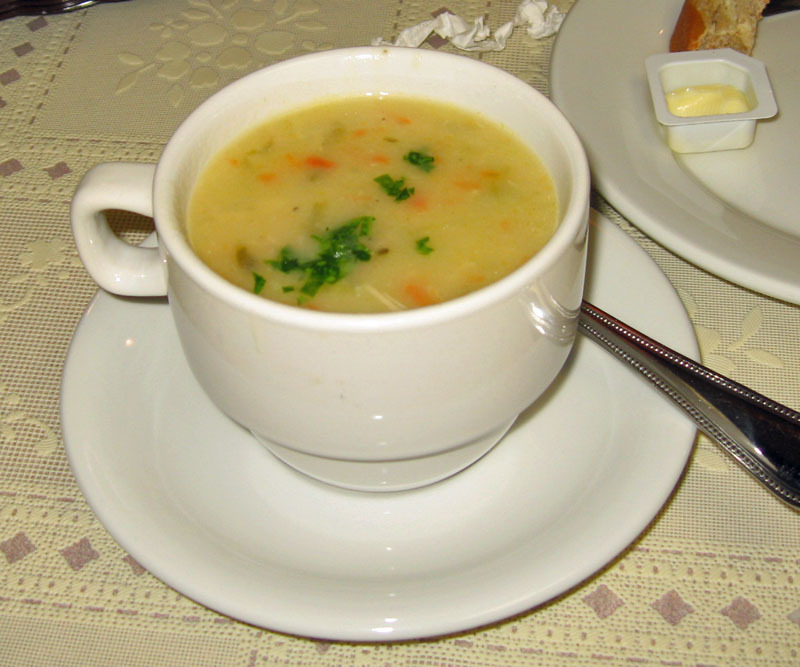 It was a chicken broth based soup, thickened a bit with roux or cream. It had some bits of chicken in it but also boaste small chunks of potatoes and shredded dill pickles. Celery and carrot served to add flavor and texture, and the bit of dill was just right--not at all overpowering. This was an excellent soup, one which I will try to reproduce sometime soon. 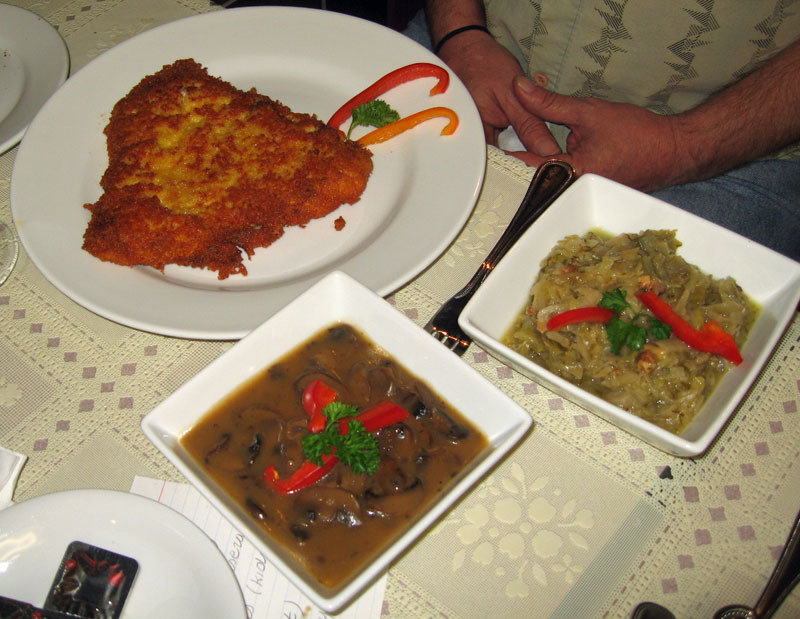 By the way, Ewa also had the Pickle soup and Joe tried--and loved--the żurek or so-called White Barszcz. When I first came I had this on my mind, but the Pickle Soup sample told me that I just had to try it this time! As an entree and to go with his sandwich, Tommy ordered the pierogi appetizer--three pierogi served with caramelized onions. 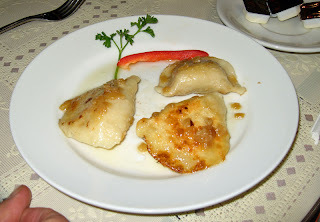 He chose two potato and one meat pierogi and requested that they be pan fried. They arrived prepared perfectly, just as he'd requested. A request for some sour cream was promptly carried out and he enjoyed this delicious appetizer. 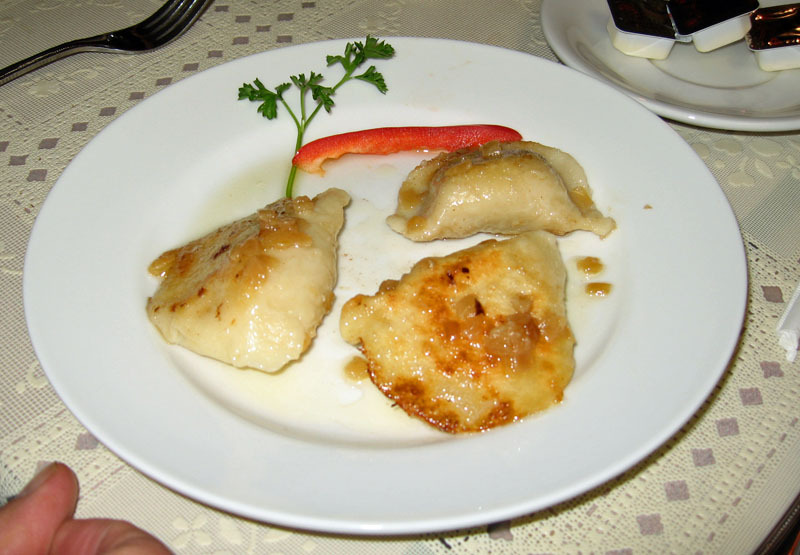 After all, who can't love pierogi? And these were very good! 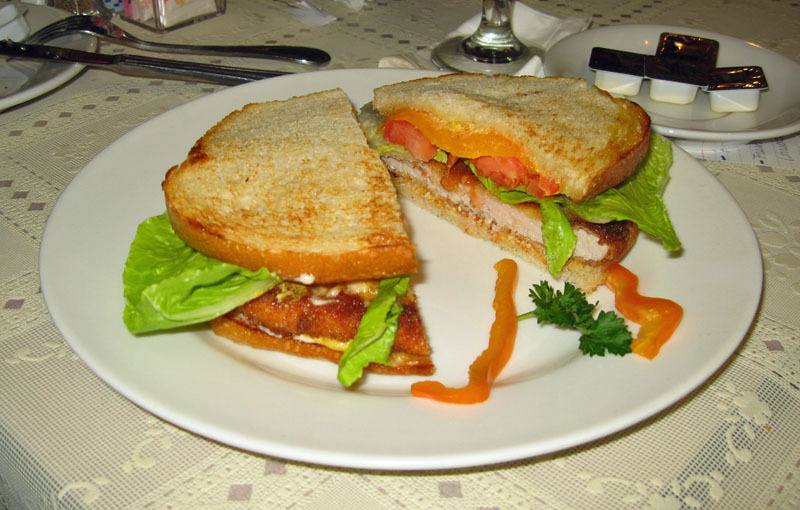 For his entree Tommy had the Pork Cutlet Sandwich, a pounded pork cutlet that was breaded and fried golden, served with cheddar cheese, tomato and lettuce on a delicious toasted bread, and seasoned with mayo and mustard. I had a bite--it was truly delicious. By the way, Tommy was the only one without a doggie bag. Perhaps he was the smartest one when i came to portion choice too! For his entree, Joe had the Pork Schnitzel, a piece of pork that had been pounded thin then breaded and pan fried to perfection. It was a large piece of pork and was served with two sides. For one side Joe chose the mushroom sauce which was thick and rich with a deep woodsy mushroom flavor, rich and delicious. For his other he had the Cabbage Salad which I raved about in my first review. It too was delicious--served warm, the cabbage flavor was mild, complimented by the bits of bacon and highlighted by a gentle dill flavor. Another very succesfull dish. Ewa was in Polish heaven with her meal--she had the Polish sampler. 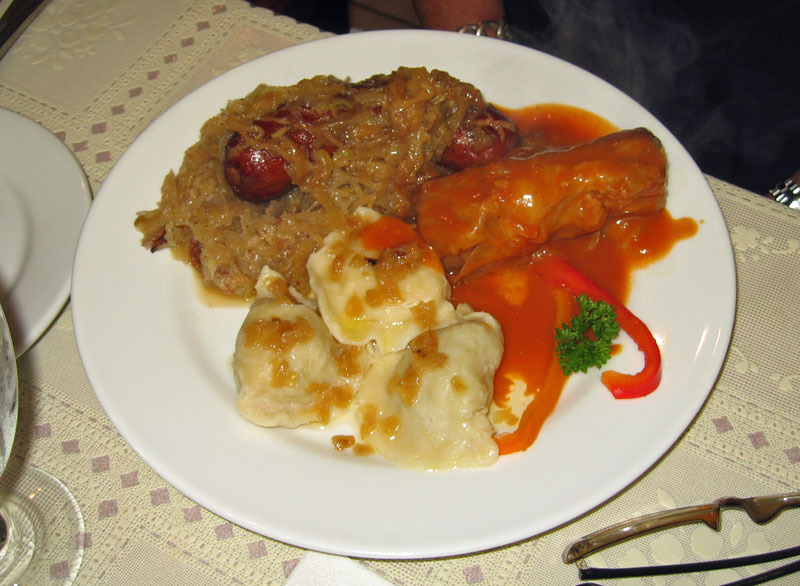 It does not get better than this: Three pierogi, one each of meat, sauerkraut and mushroom, and potato and cheese, along with a gołųbki covered with tomato sauce and also a grilled kiełbasa served with sauerkraut. This was truly a very good meal, and a good sample of Polish cuisine. Hearty yet flavorful, Ewa did pronounce it bardzo smaczne--very good eats! I decided to try the Cracovia Chicken Filet which is listed as the Chef's specialty. I can see why. It was a tender chicken cutlet that was coated with a parmesan dough and fried. For my sides I chose the kopytka and asked if I could get bigoś as a side--I sure could. Both were delicious. Kopytka are potato dumplings, usually rolled into a thin rope, then sliced into inch long pieces and boiled. 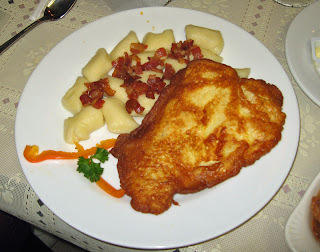 They were served with some bacon bits and were everything a kopytka should be--potatoey and delicious! But the star of this meal was definitely the Chicken--it was moist, juicy, and tender, and the parmesan dough coating gave it an excellent flavor. I really liked this a lot. But on top fo that all was the Bigoś. Bigoś is a hunters stew made with a base of cabbage-sauerkraut to which various meats such as pork, beef, and sausage and other ingredients such as mushrooms are added. It's a very hearty dish. Now my friend Ewa makes a wonderful bigoś and did not think anyone could make one as good as hers. 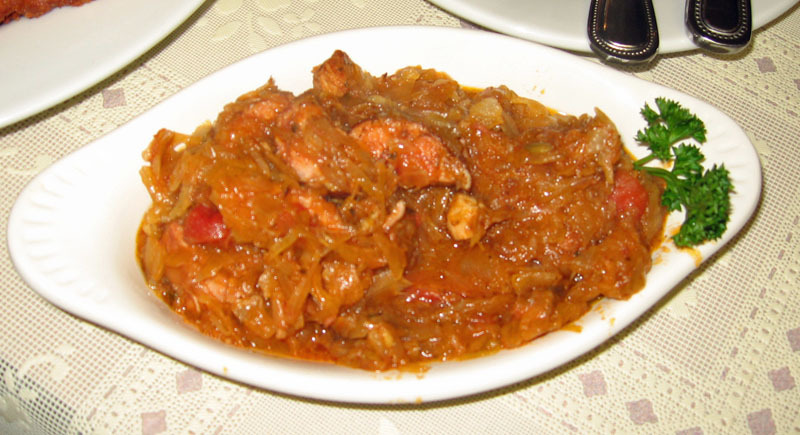 But upon tasting this bigos, she proclaimed that it was so good, it was equal to hers--very high praise indeed. And it was indeed very good. We had a very good meal at Anna's--excellent even. The food was a little bit slow in coming out, but then again, when it's that good, it is worth waiting for. Anna's has only been open a short time, but I beleive they have some great menu items here. I've not found anything I don't like so far. I can't wait to come back again--and again and again. As a matter of fact, Ewa is planning on coming back in just a few days, just for lunch. Yes, it's worth the trip! Newly opened Boston's Fish House in the Lake Mary/Sanford area is the third location for this small local chain. I had high hopes for this location based on my previous experiences at their other locations. I was not disappointed. We arrived here on a Saturday night around 7:30 or so to find a line outside the door. A very pleasant hostess told us it would be around 20 minutes or so and we decided to wait it out. No name taking--you just wait in line. The method of food ordering is somewhat unique here: you go to the counter and place your order, then are given a number. Another host/hostess will show you to a table as soon as one is available. The process seems to work quite well, al the tables stayed full and yet once the food was ordered, people did not have to wait any longer for a table. Good flow control I guess. We both ordered the Fish and Chips special which turned out to be nothing more than the "Fish Pieces" they had on the menu. It wasn't bad, but you do get an additional dose of the deep fried breading when your fish pieces are small. It was good, no doubt. For my sides I had the baked beans and coleslaw. The coleslaw was delicious, though a tad sweet for me. The baked beans were unremarkable--not bad, but a lot like boston baked beans you'd get out of a can. Maybe that's what boston baked beans are supposed to be like. We also shared an order of onion rings. My friend Tommy had the fries with his fish fry, but reported that they were just ordinary fries, nothing spectacular. We stopped by here on the spur of the moment last Friday night. We'd attended the Sanford Fourth Friday Art Walk and were hungry. One of our favorite places had just closed, so we decided to hit Angelo's. It was a good choice. My friend Tommy and I both ordered the same thing, a special pasta dinner. I don't even recall for sure what it was called, maybe Christos something, but the dish itself was quite memorable. Tender medallions of chicken had been nicely cooked, still very moist and tender. These were served over a bed of penne pasta. It was topped with an alfredo sauce that contained artichoke hearts and black olives, and it all was topped with some sun-dried tomatoes and a healthy dose of parmesan cheese. This was a very good dish. Not only was the taste point-on, but for $8.99, we each had enough to take home for a second meal--quite a value. Based on my previous experiences at Angelo's, this is a gem of a place. Not fancy, just good eats! On the fourth Friday of each month, the Sanford Welcome Center hosts and Art Walk. Area artists display works in the Welcome Center and visitor vote for their favorites. The other Sanford galleries are also open and also hold special events. Most of the venues have appetizers and wine as well. It's always a fun night and always a busy night. The Art Walk held last night was no exception. My friend Tom Abbott entered a work in the exhibition. Though he did not win, all the participants and visitors were the winners because they got to see and enjoy some really nice art and rub shoulders with a lot of the artists. I especially enjoyed talking with Ken Balboni, a digital photographer, how had a photo that I really liked. He gave me some great photography advice, too. It was nice to meet some of the other artists as well. It's always a busy event, and they have wine (from the Sanford Wine Company, just down the street) and appetizers galore as well. They had a good turnout last night as usual. It's really a lot of fun and a great time. I also spent a good amount of time hanging out at Art Affair Gallery, katty-corner across First Street from the welcome center. They were very busy last night. They recently moved down two doors to the corner shop, twice the size of their former location. If last night's traffic is any indication, it's a really happening place, for sure. I spend a lot of time there because my friend Tom helped Ronda open the first location, did some of the work on the new location, and has a number of his works on display at Art Affair Gallery. They have a lot of nice stuff and I am a big fan, definitely. 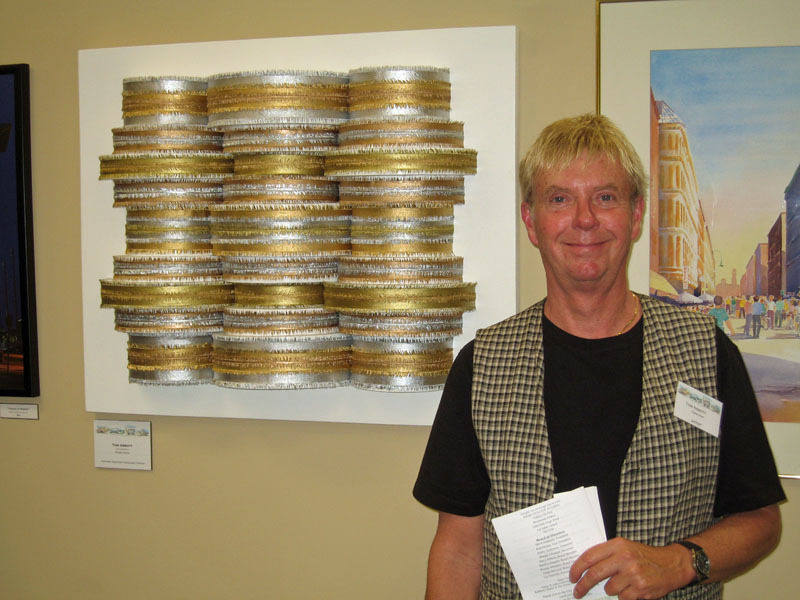 To add to the festivities at Art Affair Gallery, yours truly took along an appetizer. Now I will admit it's a rip-off of something I'd had at another party some time, some where, but I don't recall just when or where. I took a whole pineapple and--very carefully and with a very sharp knife--quartered it. Then again with a sharp knife, i trimmed out the core, cut it longitudinally most of the way through, then made latteral cuts about every inch or so, again, most of the way through. Finally, I again used very sharp cutting utensil and cut along the skin. 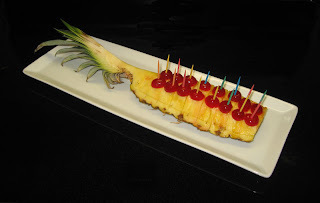 Then I cut maraschino cherries in half and with a toothpick, put a cherry on each piece. The tootpick served to hold the pieces in place, and even where I may not have quite cut all the way through, the pieces were easy to remove. I had reports from Art Affair that people commented very favorably on this and loved it. It was fun to make and quite easy to do, actually. And as you can see in the picture, the presentation is spectacular! Gallery on First was also open though I did not make it in there last night. Still, they also have some nice stuff--they have rooms they rent out to local artists, a big room where they have changing exhibits, and in the front they sell their specialty--southern folk art. Down around the corner, Riverhouse Pottery also had an artists' showing/competition. They had a number of pieces of glasswork and glass-based jewellry. I did go and vote on my favorites. They also had some delicious meatballs, by the way! Yumm. And not to be outdone, Little Fish Huge Pond also had an artist's opening last night. If you've never visited this quaint little bar, you really need to. The often have live music on the weekends and there is always an art show going on in there as well. It's really a fun, friendly, welcoming, and definitely avante garde place. They are, by the way, listed in my current personal order of preference, but don't get me wrong, they're all great places to eat and I highly recommend andy and all of them. You cannot go wrong eating at any one of them and each has its own unique charm. All have excellent food. There! I did manage to incorporate enough about food into this post, didn't I. Downtown Sanford is a very fun place, even when there is not a special event going on. 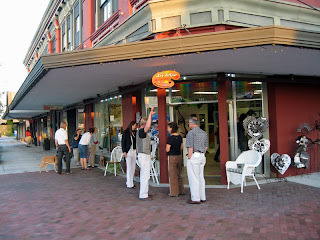 But with the special Fourth Friday Art Walk and the second Thursday Alive after Five party, it's an even more fun place. I love it. I hope you'll give it a try one of these days, too. Wow! Best brisket I've ever had. Quite an amazing meal here, and certainly worth the wait. I have driven past Four Rivers Smokehouse a number of times and there has always been a line, out to the road. I wondered, "what was the attraction?" The reviews on urbanspoon.com have pretty much all raved about the food. A few fellow bloggers, as well, have given this place the thumbs up. But always a line? Well, I guess that means something. My friend Tommy and I decided to "tough it out" and headed down to four rivers on a recent Friday night. Indeed, there was quite a line. It took us a bit to find some parking, but we did and got into the back of the line. It was not moving very fast. But the place was a beehive of activity, no doubt. We ended up visiting with some newfound "friends" in the line. Turns out we were newbies and they had all been there before. And indeed, they came back expecting to wait a long time in line--they said it was just that good. Our wait was somewhat tempered--and somewhat made all the more that anxious--by one of the staff who came around twice with tantalizing samples of the food--first some pulled pork and later some pulled chicken. This sample did not dampen our appetite at all, but only served to whet it. Great marketing technique! So, about 45 minutes after first getting in line, we finally got to place our orders. We both settled on a dinner with an extra meat which included three sides and a biscuit. We chose wisely so as not to overlap the sides, but both settled on brisket and pulled pork for our meats. A tray was produced, a sheet of paper put on it, some hieroglyphics written on it (our order, I guess) and our meats piled on the paper. Then our sides were also added and finally we went out to the self-serve patio....a series of picnic tables. We found our drinks and our plastic tableware and proceeded to make new friends. The verdict? Well, it was the best damned brisket that I'd ever...ever... had. It was worth all the wait and them some. Plastic tableware? The brisket was so tender I never even touched the plastic knife. I was totally in awe of this food. Both Tommy and I had the brisket and the pulled pork, and we both thought it to be awesome. For my sides I had the BBQ Beans---they were excellent with a nice meaty flavor and just a hint of vinegar. I also had mac an cheese which was good, and a cheese grits cake--true heaven for a grit-lover like me. And the biscuit was also very good. I have to mention the sauces--there were two. And both were very good. For the normal palate, there was a normal, very good BBQ sauce. For the heat lover such as myself, there was an extra-hot variety--and I loved it. The brisket itself (and the pulled pork, too, for that matter) showed that they were cooked with excellent technique. I'm told they cook the brisket for 19 hours and that does not surprise me. You do not get brisket that tender in short time. It was indeed awesome. I'll note too that the server knew how to cut it--I watched as he cut around any fat and gristle and made sure that what I had was all meat and good meat--excellent job. For sides Tommy had the coleslaw--it was very good, and fried Okra. I liked the fried Okra and thought it cooked well, though it needed just a bit of salt. But overcooked and poorly prepared okra is slimy, and this was not--it was done just right. And for his third side he had one of the best side dishes of the night--sweet potato casserole. This was pure whipped, creamy sweet potatoes with some pecans--not overly sweet, just a lot of sweet potato love in it. We had four excellent meals here. Two on Friday night, and each had enough to take home for another excellent meal. A 45-minute wait? Worth every minute of it. Will I be back? I'm already plotting my next visit. Best BBQ I've ever had? Yes, withouth a doubt! I had high hopes for Malibu Beach Grill because they are a sister to the fabulous Monterey Grill just around the corner and down the street a bit. But my meal here left me with mixed feelings. Perhaps I set my sights too high? Don't get me wrong, I had a nice meal here, but it did not quite meet my high expectations. Still, the meal was above average, no doubt! My friend Tommy and I headed to Port Orange on a recent Friday evening, anxious to try this sister of our favorite Monterey Grill. We arrived at prime time to find that it would be a 45 minute wait. Well, we were interested in trying it out, and if it was that popular after only being open just over a month, we were willing to wait. We parked ourselves in the small bar/lounge and waited. Our service in the bar/lounge was great. We had ourselves a drink and eventually secured a few seats at the bar. Eventually, our buzzer sounded and we were quickly shown to our seats. Malibu Beach Grill is not a huge place, and seems a bit cramped. But there was more than adequate staff who all seemed very competent and well trained. We were quickly seated by the host and in short order our waitress, Andrea, arrived. We started off with the Chez Mushrooms--small button mushrooms that were served on a sizzling cast iron platter in a bit of oil and covered with mozzarella cheese. They were OK but did not live up to the hype. They were a bit on the salty side, and that took away from them. I would not order them again. They weren't bad... but they did not excite me a lot either. On to the soup. Yes, I saw Tomato Bisque on the menu and just had to try it. A good tomato soup of some variety is a favorite of mine, so I was excited to see this on their menu. First the good. There was a very nice tomato flavor here, and it had a great texture--almost meaty in texture. However, the great flavors were a bit overpowered by too much salt. As in way too much. 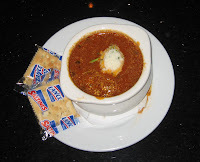 I believe a diner should be served with food that is either perfectly salted, or even a bit under-salted--but my Tomato Bisque showed a heavy hand with the salt. It's too bad, because the rest of the flavors were spot-on. Take away the extra salt and this bisque is or could be a real winner. Our salads arrived in due order. They were good salads, nothing too special but certainly a cut above ordinary. My dressing was a house mediterranean italian type with olives and citrus in is--it was actually very good. I liked it a lot and it was fairly unique. It was a good salad with fresh ingredients and not too "wet"--something I really hate. 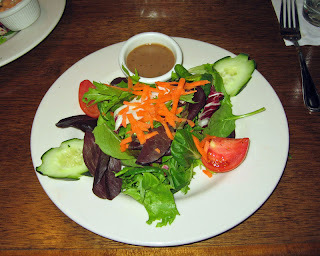 I'd have this salad again, no doubt. Finally it was on to our main courses. I was having dinner with my friend Tommy. For his main course he ordered the Paremsan Chicken. All I can say is "wow!" This was really a very nice dish. 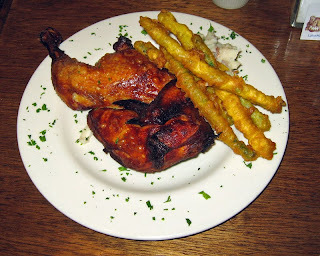 The chicken was extraordinarily tender and juicy--exceptional in flavor. The parmesan-crusted chicken was flavored with a lemon cream sauce and it too was good. This was a very, very good dish, the Chicken was excellent. Along wiht this was a medley of vegetalbes which was good. And last but not least was the parmesan mashed potatoes--this was the weakest element of the dish. The potatoes were very creamy and thus had little texture. They were also a bit watery and slightly bland. They could have been seasoned a bit more and could have stood up to less cream/butter--in other words, they were just a bit too blah. The needed a bit more texture and firmness. They weren't bad, they just weren't as good as the other elements of the dish. As for my entree, I chose the Ginger Soy Shrimp--eight large shrimp which were served in a ginger soy sauce. This was just an OK dish for me. The shrimp were just a bit past cooked--in other words, slightly overcooked. The ginger soy sauce was lacking in some pizzazz quality--it was OK but it did not overwhelm me with either ginger or soy flavors. It left me wanting for something to make it really stand out. For a go-with I had the black beans and rice. They were OK but not more than that. Our service for our meal was very good. Not only did our waitress take good care of us, but other waitstaff were always attentive, removed used plates and the like promptly. 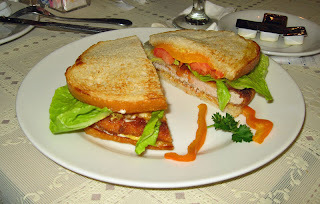 Malibu Beach Grill has only been open a short time but shows great promise the staff is very well trained and attentive. The food, though good, could use a bit of fine tuning. Still, I believe that in time this will turne out to be a fine place. It may have a few growning pains to go through, but it has definite potential! I just discovered tonight--quite by accident--that the Rotary Club of Lake Mary is sponsoring the 2010 Taste of Lake Mary on Monday night, March 29th, from 5:30-8:30. It will be held in the courtyard between the Orlando-Lake Mary Marriott and the Park Place at Heathrow, just off of CR 46a and International Parkway. Tickets are $40. Last year they hosted over 600 people. See the Rotary Club of Lake Mary website for more details. I'd give more, but I've got to run out and buy my tickets, I can't wait! I do promise to write all about it, believe me! I've had food from Lee's Palace a number of times--usually takeout--and it's always been quite good. But last night my friend and I went there for dinner and decided to eat-in. It was a good decision. Lee's is not a large place inside, maybe 8 to 10 tables. We ate there on a Sunday evening and there was only one other table full there. However, I've been in here a number of times getting takeout and it's usually somewhat busy. They've been in this location for probably 5 or more years--a testament to their success. Our eat-in meal was very good as well. We were promptly greeted and given our choice of tables--we chose to sit right by the window, it was a pleasant evening. We ordered two appetizers. The first was Shrimp Tempura--4 large shrimp dipped in a tempura batter, deep fried, and served over a bed of shredded chinese cabbage. They were served with a tasty dipping sauce--a sweet and sour sauce that complimented the delicate flavor of the shrimp. We enjoyed this dish. For a second appetizer we had Pan Fried Dumplings--commonly known as Potstickers. Six tasty pan fried dumplings were arranged on a bed of shredded Chinese cabbage and served with a tasty soy-based dipping sauce. The sauce however was quite light and did not mask the flavor of the dumplings--they were actually excellent. I could have eaten a whole plate of these little delicacies, the filling was that good. 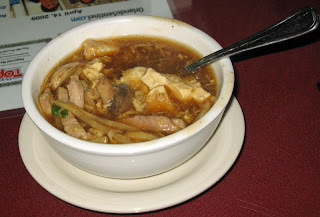 I had the Hot and Sour Soup and my friend, Tommy, had the Won Ton soup. Both were very good. I've had the Hot and Sour soup from Lee's a number of times. Often on a weeknight, I'll stop here on the way home and order just a pint of the Hot and Sour soup. It's very good and usually a good balance of hot (as in spicy hot) along wiht the sour. I've found it to be consistently good, time after time. 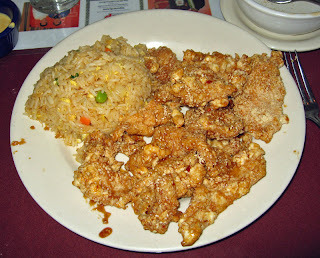 For his main course, Tommy ordered the General Tso's Chicken--big chunks of chicken white meat that had been breaded and fried, then coated with a somewhat spicy, rich and tasty sauce. A few pieces of broccoli acompanied this dish. It was served with pork fried rice and also an egg roll. I had a taste--it was very good. I am a big fan of this dish, though I will say, I'd like it a bit hotter, but for most I think it is just right. For my entree, I chose the Cashew Chicken--tender pieces of Chicken that were wok-fried along with some onion, peppers, and a few other Chinese vegetables, then finished off with unsalted cashews. This was a very good dish, all the flavors blended nicely with the finishing sauce and the cashews added a creamy crispness to the dish. The fried rice was good, nothing too special, but just good. I'd say the egg roll too was just good. Overall, we had a very good meal here at Lee's Palace. The food was good as was the service. Usually I order take out here, and I'm sure I'll continue that tradition time after time. Always good! Always busy, always fun, and always good food--that sums up Hollerbach's Willow Tree Cafe in downtown Sanford. My visit there the other night with my friend Creighton only served to reinforce what many an area resident (and visitor) already knows--Hollerbach's rocks! We journeyed out on a rainly and gloomy Friday night. Most of downtown Sanford seemed pretty well shut down. Even my favorite Art Affair Gallery was closed for the evening. But the street was lined with cars and there were plenty of people out and about--most of them dining at one of the many fine establishments in downtown Sanford. Hollerbach's was no exception. We were lucky to go there on a somewhat rainy Friday night--normally there is a wait to be seated, but not this night. Also, we were there a bit early, just before7 PM. Nonetheless, they were quite busy and the inside seemed fairly packed. We chose to sit outside as it was a pleasant evening and it was a bit quieter outside. We were promptly greeted and seated. Within a minute or two our waitress appeared and took our drink order. In due time she arrived with our drinks--a half liter of a fine German Lager for me, and a glass of Riesling for Creighton. Just as our drinks were about to arrive, the live music started. At that point we discovered we were seated right by the speaker! Our waitress arrive with the drinks and offered to turn the speakers away from us, but then also offered to move us to a table a bit further away. We gladly accepted that offer. Nice service! We promptly placed our order and, in due time, our food began to arrive. And in the meantime, we enjoyed the live music. The people inside were sure having a lot of fun, and the musicians were playing to their crowd, encouraging partipation, singing, and dancing. At one point they went through a list of the birthday celebrants there--it seems like all of Sanford come to Hollerbach's to celebrate a birthday, it was quite a list. 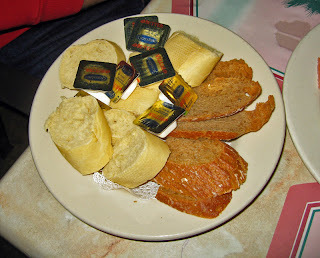 A plate of assorted bread (along with butter) was served. This was no ordinary bread. The white bread was sort of a French Bread, but quiet tasty and a bit warm. The rye bread was very, very good--a nice rye flavor, somewhat crusty, and oh, so good. For an appetizer, we ordered the Spargel mit Schinken. 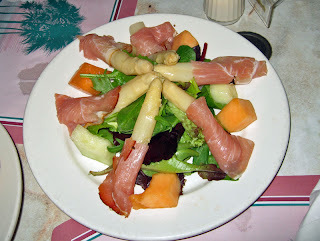 This was six spears of tender white asparagus wrapped in prosciutto-like Black Forest Ham and served on a bed of mixed greens with some melon. I was surprised by the mushiness of the white asparagus, but overall the dish had a nice flavor. That was due, for the most part, to the black forest ham. The softness of the white aparagus was pleasantly offsett by the chewy texture of the ham, as well as the crunchiness of the melon. It was pretty good though I do not think I'd order it again. I ordered a side salad. The Side salad was basically romain with some cucumbers, green peppers, onion, tomatoes, and croutons. 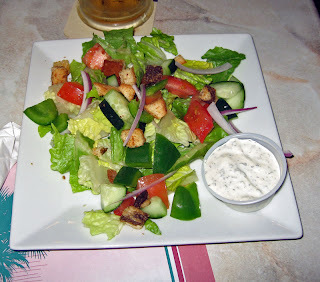 I had the homemade buttermilk ranch dressing served on the side--that was very good! As salads go, this was pretty average, but definitely a good salad. The star of the dish was really the buttermilk dressing because it was very subtle and did not overpower the the other components. For his main dish, my friend Creighton had the Sauerbraten. I had a bite--it was excellent. It had a nice sweet/sour flavor and was very tender. Very tender. The gravy that was over the sauerbraten was also very good, rich and dark and full of flavor. I did not try the sauerkraut, though Creighton said it was good. The Heaven and Earth Potatoes were interesting. This was mashed potatoes that were mixed with sauteed onions, bacon and apples. I think the onions and bacon were great flavors, but I found the sweetness of the apples to be somewhat confusing to my taste buds--it is not what I expect of mashed potatoes. Still it was pretty good. For my main course I had the Beef Rouladen--thins slices of beef rolled up wtih bacon, pickles, mustard and onions. It was OK. I found the beef to be just a bit dry, and had a hard time tasting the pickles, mustard and onions. Don't get me wrong, it wasn't bad, it just was not the outstanding dish I had hoped for, especially due to the dryness of the beef. 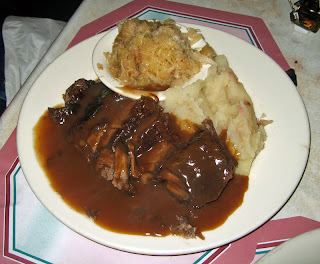 It was topped with a gravy similar to the sauerbraten, thick and dark and rich. 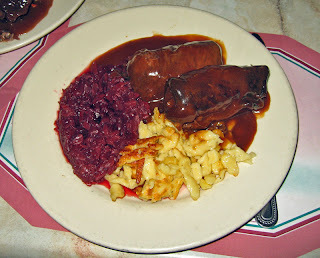 For go-withs I had red cabbage and spaetzle--both were very good. The red cabbage was good as any i've had, but not superior to any others, either. However, I did find the spaetzle to be superior--outstanding even--they were very tasty and a definite hit with me. Overall, we had a very good meal here. I'd say it was as good a German meal as I've ever had, but also not any better than some I've had. I've had an equally good meal at the Bavarian Restaurant in Longwood. Of course, where Hollerbach's excels was in the service--it was outstanding, in the atmosphere--the live music really gives the place a German feel, and in it's business--it feels like a fun place, just due to all the hustle and bustle all around you. Certainly a place to eat at if you're in downtown Sanford. 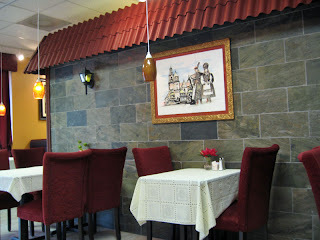 Very good German food in a nice atmosphere with a friendly staff. I'll be back! Imperial Dyansty has received some pretty impressive awards--and rightly so, I'd say. I went here for lunch recently--my first visit--with coworkers Dale and Bob. I'm so glad Dale suggested this place--I know I'll be back again soon. We ordered off the lunch menu though the dinner menu has similar item (but I'd guess a larger portion). The menu is pretty extensive and they even have Sushi prepared right there. It took a while to let the whole menu soak in. So many choices! But eventually we ordered both lunch specials and soup. As soon as we sat down, a bowl of fried wonton chips with some duck sauce arrived. It was plenty tasty and we promptly cleaned them up! For soup, I had the Hot and Sour soup, generally a favorite of mine. It was very good. So good, in fact, that after Dale tasted mine, she changed her mind about the Won Ton soup she'd ordered. Upon summoning our waiter, Princess Dale asked if she could switch. No problem! And quickly her Won Ton soup was replaced with Hot and Sour. Now that is good service! (Bob, by the way, enjoyed his Won Ton soup and said it was very good.) But, back to the Hot and Sour--it was very good. There were lots of ingredients in it, but many were still distinct--tofu, chicken, mushrooms, etc. I thought it was pretty decent soup. It was not as hot (as in spicy) as some I've had, but still plenty good. Upon finishing the bowl of soup, I was left wanting more--a good sign. 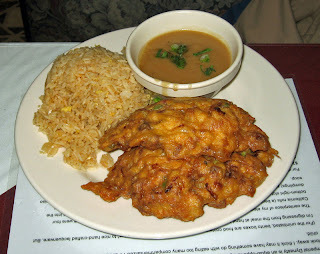 For their entree, both Bob and Dale ordered the Combination Egg Foo Young. They both said it was very good, though Dale did later wish she had not changed her mind and had instead ordered the Shrimp Foo Young. Still, the both liked it. I had a taste too and it was very good. They had the fried rice to go-with. I ordered the Sesame Chicken with Fried Rice. I would say that it was pretty gosh darned good. I'm used to having Sesame Chicken with some sort of gravy-like coating on it, and this was mostly dry--there was just a bit of a flavorful sauce here and there. Still, it was plenty good. The Chicken was nicely cook, the sesame coating mostly crispy and tasty. It was obvious that it had been cooked just a moment before being served. The fried rice was also pretty good though I'm sure had been prepared en masse a bit earlier. I had some of the house mustard to go-with and that was very good too, quite hot and spicy. Three bowls of soup and three lunch specials (with water) and our total bill came to about $23. Not bad at all. Our waiter was very attentive and knew the menu well. He answered all our questions and was there to sevice us each time we needed something. I managed to eat the whole lunch, though I'm not sure where I put it all. Dale and Bob were much smarter and had enough left to take home and enjoy a second time. Imperial Dynasty was fairly busy at lunch time, a testament to the good food. I'd certainly like to come back for dinner some time, maybe wiht a group so we could order family style. In watching some of the dishes that were served to other diners, and in surveying the scene on the way out, the food all looked very good. I can see why Imperial Dynasty has gotten good reviews and won award after award time and time again. Great Chinese food in the Lake Mary area, for sure! I am sure glad we went here recently, Genuine Bistro & Lounge has very good food and very good service in a nice, friendly atmosphere. My first attempt to eat here found a full restaurant with a 45 minute wait unless you wanted to sit outside on a cold Florida evening. So when my friend Tommy and I came back another time, we were pleasantly surprise to find no wait. In retrospect, it probably would have been worth the wait! We were promptly greeted and shown to a table, and given a choice of a table--that was nice. They were not crowded but as the evening progressed, they had a steady flow of patrons. After a short wait, Adam, our server, took our drink order. When the drinks came back, we were ready to order appetizers, and we did. We started off with two appetizers. The first was Zucchini Planks--bias-sliced "planks" of fresh zucchini had been hand-battered in a tempura and then deep-fried. They were served with a horseradish sauce. This was a hit, for sure. 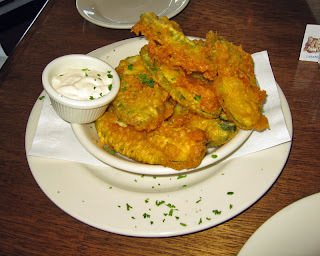 Of course, taking something moderately healthy like zucchini and deep-frying it mitigates the health benefts, but on the "good eats" side of things, this was very good. When it came to the table it was fresh out of the fryer and very hot. Very hot! It could have used a slight sprinkle of salt before being served, but we managed. The horseradish dipping sauce was creamy and not overly hot--very good, actually. So good that we had to ask for more, which promptly appeared. Our second appetizer was the Atomic Shrimp. Five rather large gulf shrimp had been battered (again, in a tempura) and deep-fried, then tossed in a creamy garlic sauce. They were served on top of a bed of shredded iceberg lettuce. The plate was "decorated with several stripes of sriracha sauce--very hot and very good. The sriracha is what I thought gave the shrimp an "atomic" taste, not the creamy garlic sauce. The tempura was just a slight bit doughy, but overall this was a very good dish. 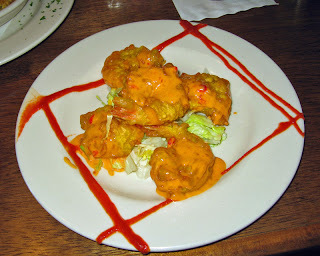 I loved the zing that the sriracha gave this dish, and the presentation was excellent, assuredly. We ordered our main dishes and salads before the appetizers arrived. Our salads appeared shortly after we finished the appetizers. The salads were very good--a mix of various greens was accompanied by some shredded carrots, some nicely sliced cucumbers and some tomato wedges. The dressing was served on the side, something I always like to see. I had the balsamic viniagrette, dressing, it was very good. Once we finished our salads, we had a bit of a wait for our entrees. There was another large party of about a dozen nearby, and their food came out first, so my guess is that was the reason for the slightly long pause. No matter, it was worth waiting for. My friend Tommy ordered the Crispy Slow Roast Chicken. It was an excellent choice! A half chicken had been marinated in aged balsamic vinegar and citrus, then roasted. It was served with tempura (again!) asparagus spears and mashed baby red potatoes. The chicken was excellent. It had a great flavor, picking up a hint of the citrus and balsamic vinegar. The skin was very crispy, the meat juicy and flavorful. The tempura asparagus spears were good, though I thought the tempura slightly overpowered the flavor of the young and tender asparagus. And who can't love mashed red potatoes with their flecks of red skin, sligth lumpiness, and garlic, butter and creamy goodness? This was a very good choice, and very good food. My dish was equally good. I had the Genuine Cedar Plank Smoked Salmon Filet. The smokiness was very subltle, but the salmon was juicy and tender. 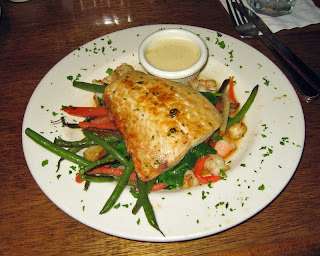 It was served with a warm horseradish beurre blanc, not overpowering and a perfect compliment for the salmon. The dish was served on top of some baby gulf shrimp, baby french beans, yukon gold potato strips, red peppers, and spinach. The menu claimed this had tomato and shallots, though I did not see any evidence of tomatoes, I'm sure it was red peppers. No matter, it was very, very good. Every element of this dish seemed to go together. The crispiness of the baby green beens, the starchy and not overcooked potatoes, the mushiness of the spinach, the tenderness of the flaky salmon--all were very, very good. This was a very good dish and i managed to finish it all. We were stuffed, but not done--we wanted to try dessert. Tommy ordered the Genuine Key Lime Pie. This was good, solid key lime pie. The presentation was, again, very good. 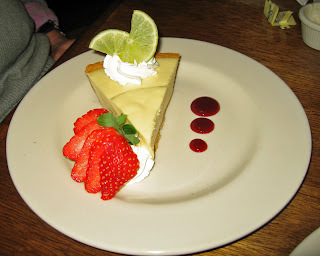 A nice slice of key lime pie had a graham cracker type crust and was served with strawberry and chantilly cream. It was good, very good, but was just key lime pie. A good key lime pie, however, a good key lime pie, better than most I've had. 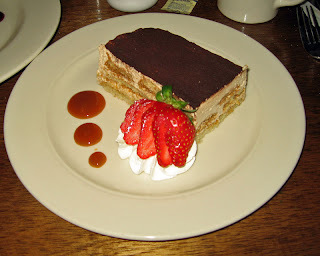 Of course, to my mind, dessert calls for coffee, and we also ordered and had coffee with our meal. The coffee was very good, nice and strong, but not overpowering. Good coffee and it served as a nice counterpoint for the sweet desserts. For dessert I ordered the Tiramisu. The first thing that struck me was that it was a huge piece! OMG! Ladyfingers had been dipped in white chocolate cappucino and layered with mascarpone cheese. It was topped with a cocoa/cappucino powder and garnished with a strawberry and chantilly cream. This was very, very good. It was not overly sweet which was great. But the portion was huge, and I did not finish it. Fortunately, there is some leftover for another time. Our waiter, Adam, was very attentive as was the other staff. When finished with a plate, it promptly was whisked off. When we asked for something, it promptly appeared. Admittedly, we spared no expense, starting off with a glass of wine and a bottle of beer, and ending up with coffee. Still our bill of about $78 with tax but not including a generous tip did not seem out of line for what we had--a very good meal. I was surprise that this place was not very large inside, but they have a large outdoor patio. On a nice spring, summer, or fall evening, this would be a nice place to relax and have dinner as well. I'm sorry we didn't wait the first time we were here, the food is very good. We will be back, I'm sure. I recommend you try this place, it's great!